This entry was posted in Vacuum Tubes and tagged 300B by tubemaze. Bookmark the permalink. 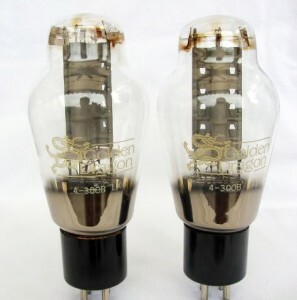 Recently I had a chance to try these tubes out in my amp. They had around 1,000 hours one them and very well burned in. The tubes has a solid construction and titanium anode, which didn’t really help in this case. This is one of those tubes that really didn’t work for me. The sound was thin, transparency just OK, bass was not superb and it was too bright. It was a relief to switch to my default Genalex tubes. Kind of disappointed after reading some good reviews of the tube.